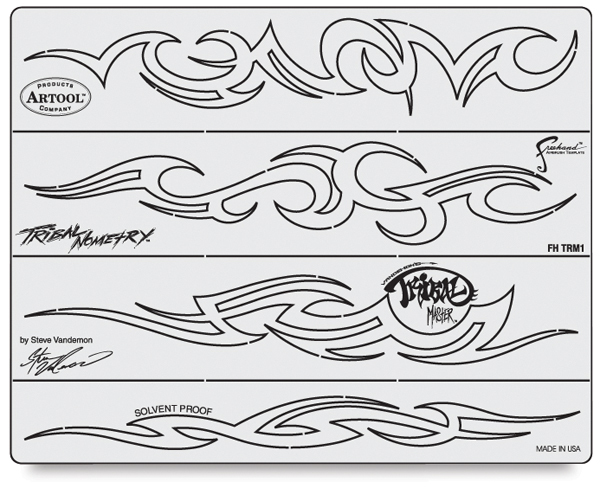 Go tribal with Artool Tribal Master Freehand Templates, designed by Steve Vandemon of Absolute Custom Paint in Anaheim, California (and Monster Garage and Pimp My Ride fame). They help you master intricate tribal designs in minutes instead of hours. Original Tribal Master templates include three round Cirque du Trible shapes and four linear Tribalnometry designs. The circular shapes let you easily create a myriad of background images and extremely intricate symmetrical themes. The linear shapes can be applied to long, straight areas or curved around bike tanks, fenders, and other irregular-shaped surfaces. Tribal Masters II Cornered templates perform amazingly well for rendering tribal imagery on tanks, fenders, helmets, murals, fine artwork, and illustrations. Try layering them with the original Tribal Master designs to concoct more uber-tribal mojo than you'll know what to do with! Like all Artool stencils, these templates are made of tough, solvent-proof plastic. When you're done, simply clean them up and get ready to use them again and again. 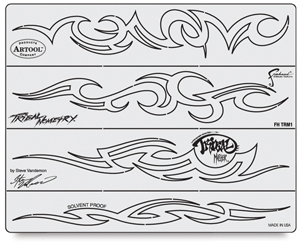 All Artool Tribal Master Freehand Templates measure approximately 8" × 11" (20 cm × 28 cm). ®Artool is a registered trademark.® Freehand is a registered trademark. ™ Tribal Master is a trademark. ® Crique du Trible is a registered trademark. ® Tribalnometry is a registered trademark.